Hong Kong offers a stunning arrays of delicacy from street food to Michelin Star Rated Restaurants, visitors are spoilt for choices available. Feel free to check out our 20 Must Visit Hong Kong Attractions, 12 Must Visit Macau Attractions & 16 Must Eat Food in Macau. or Things to do in Hong Kong. We experienced culture differences in Hong Kong that you should know to avoid paying more, getting bad experiences, or landing you in an awkward situation. Sharing a table in Hong Kong is norm & expected in most places apart from restaurants. Crowded places expect you to eat and leave as fast as you can. People in Hong Kong can be very rude & might even scold their customers though friendliness & politeness is quite subjective. We noticed some improvements compared to our last trip. Founded by the grandson of the founder of Yung Kee Restaurant, Kam’s Roast Goose scintilate diners with their plump & juicy well roasted goose. The goose are well marinated camp style to ensure the marination penetrates into the meat while keeping them moist during roasting. Kam’s Roast Goose was awarded 1 Michelin star (2015-17), you can expect a long queue especially during peak hours however waiting time is usually less than 30 mins. 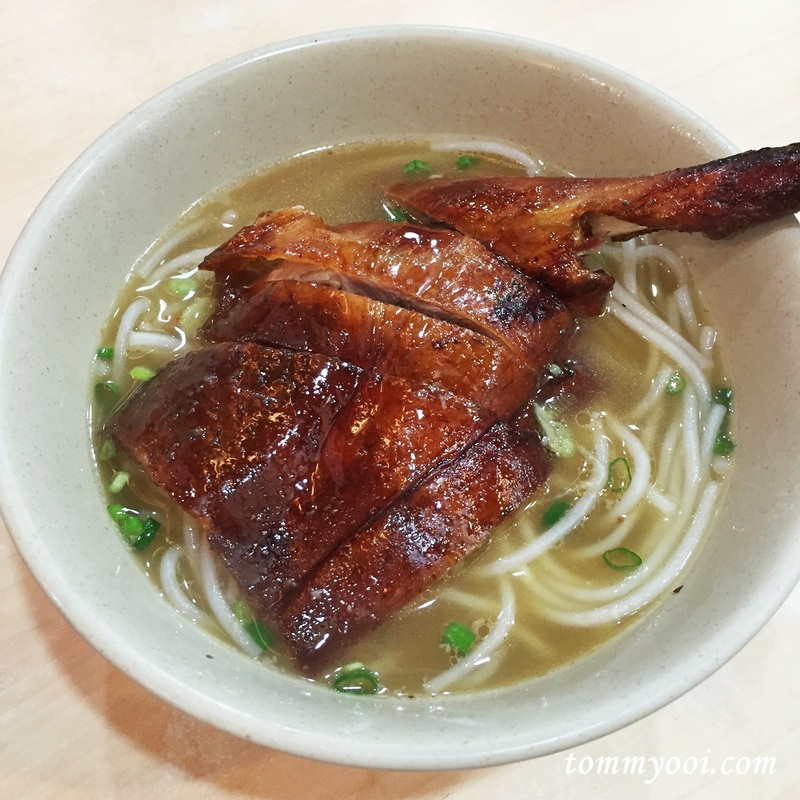 Comparing to another 1 Michelin Star Yat Lok roast goose, we would say Kam’s Roast Goose holds a upper hand. How to Get There : MTR – Wan Chai Station A4 Exit. Probably one of the best beef brisket you can find in the world, the delicious, tender, slow cooked beef brisket cooked in a broth of spices, never fails to disappoint with long queue of eager devotees waiting to devour the legendary noodle. Make sure to order the curry tendon beef brisket, divinely rich curry sauce & tender beef brisket. One of locals favorite place for decent, delicious and affordable all day breakfast Hong Kong style. The fast paced movements of the waiters mean they expect you to keep up to them or risk being scold. This is definitely not the place for a cup of coffee to enjoy for the whole afternoon. Customers comes and leave quickly allowing the next customers to dine. It is common to share seating place with others when it is crowded. Food is served at unbelievable speed and accuracy. Once taking a bite of its fluffy scramble egg along with the pillow soft inside & yet crispy at the outer toast, sipping Hong Kong Milk Tea and not to forget the creamy Custard Milk, all the negative sides are meant to be forgotten and that’s the reason of many loyal & returning customers. Getting There : Jordon MTR – Exit C2 ( Right ). Walk ahead to the junction and then turn right. The world famous 1 Michelin Star Tim Ho Wan is definitely the best place to experience dim sum at a reasonable price. The owner, Mak Pui Gor was the former dim sum master at the 3 Michelin Star Restaurant in Four Seasons Hotel before opening his own store to allow common people a chance to experience & indulge in fine dim sum. When arrive, inform the counter lady the no of pax and get your no. However be warned, make sure you have ample time as long queue awaits you. Try avoiding lunch & dinner time, weekends and holidays. Mak Man Kee Noodle is famous for its all shrimp Wanton, any bite of its wanton will bring utmost satisfaction of the freshness and the firmness of the shrimp. The shop is just 3 or 4 lots beside Australian Dairy. If you are wondering why most wonton noodles shop in Hong Kong has the Mak as its name is due to all Mak’s noodle originate from the same master chef and inherited by his children and proteges. Comparing other Mak’s noodles, we find Mak Man kee wanton the most succulent. Over half a century of the same dedication, the egg tarts – as well as the other tasty baked offerings — at Tai Cheong Bakery in Central has created a legendary Hong Kong tea-time story. Tai Cheong’s Egg Tart is Hong Kong’s former British Governor, Chris Patten’s favorite. Make sure to buy them when it is hot from the oven !! Getting There : Central MTR – Exit D2. Take the elevator up to the Mid-Levels. You’ll see an “exit” for Lyndhurst Terrace. Tai Cheung Bakery will be situated on the right when you go down the stairs. Fei Jie Snack Shop offers a variety of braised skewered seafood, meat and innards. The shop is fond by locals looking for a quick bite of the tasty innards and meats. Apart cooking methods, most innards requires extra skills and attention to clean and remove the odour. Hence most people would rather buy than prepare themselves. Getting There : Yau Ma Teh MTR – Walk towards Ladies Street. Intersection between Dundas Street and Fa Yuen Street. Kam Wah Cafe serves one of the best Pineapple Bun in Hong Kong. Bo Lo Bao or Pineapple Bun doesnt have pineapple in it, only due to its top crust of the bun that resembles the fruit. Crispy golden brown crust with soft bread with every bites contains a chunk of butter that start melts in your mouth. One might not be sufficient for lovers. Located in an offbeat alley, Lan Fong Yuen is a easy miss however its popularity for their legendary smooth & sikly Stocking Milk Tea is what attracts locals & tourist alike queuing patiently. Started in 1952 as a Dai Pai Dong (street cart), Lan Fong Yuen pride themselves to be the creator of the pantyhose milk tea. The Chicken chop macaroni is quite good as well. Forget bout the pork chop bun, it is below average. Getting There : Central MTR – Exit D2. Walk towards the Central Mid Level Escalator on Queens Street. What do you expect from simple instant noodle? Nothing much i guess. Yet Sun Kee took instant noodle to the next level with their lip smacking grilled pork cheek, creamy cheesy sauce instant noodle. Though food presentation is lacking, yet its hard to find another outlet does the pork cheek better than Sun Kee. Cheap, tasty and dip in curry sauce, Curry Fish Ball is one of Hong Kong’s most iconic street snack. The stall is just located beside King of Coconut where you can enjoy both delicacy in the same place. Getting There : Yau Ma Teh MTR – A2 Exit. Near Ladies Street opposite Starbucks. A hidden treasure in Hong Kong, this small restaurant is relatively unknown to tourist only frequented mostly by locals. The restaurant shot to famed with its signature dish Salted Egg with Steam Minced Meat Tower 咸蛋蒸肉饼 to be paired with rice. Man Fai is famous for their cuttlefish ball, baby squids, and octopus heads. You can order separately or like us in a bowl with rice noodles and clear broth. We ordered Seaweed 8 Treasure Noodle (HKD72) to try all their specialties in a bowl. The portion is large, enough for 2 people. Earning its one Michelin Star, Yat Lok Roast Goose is one of many Hong Kong mom and pop joints that simply executing what they do best. Delicate crispness with perfect ratio of meat & fat, sinking our teeth into the juicy roast goose drumstick was pure satisfaction. Getting There : Central D2 – From Queens St walk across the road toward D’Aguilar Street and turn right into Stanley Street. Walk past Luk Yu restaurant. Yee Shun is famous for their deliciously smooth and fragrant milk custard. This inexpensive and popular dessert is a steamed blend of milk, sugar, and egg white. Creamy and smooth with just the right amount of sweetness. A variety of flavors available but do try the signature double boiled steam milk and ginger milk custards. The honeycomb shaped egg waffles at Lee Keung Kee are thicker in texture, with midges of crisp around the edges & fluffy consistency that makes egg waffles so popular. It is hard to miss it with that many celebrities photos at the shop. The refreshing coconut juice from King of Coconut is definitely worth trying. Freshly blended with evaporated milk & coconut, it is very creamy & rich with light savory and buttery taste. Gam Fung for much better pineapple bun. Why is Australian Dairy on this list at all??? Hi Nono, thanks for the recommendation, do recommend if you feel others are better and we will try it out during our next trip. Do you remember if Man Fai Chiu Chow Noodle serves any pork at all? Hi, Im not very sure but mainly seafood, you can choose your own topping as well. I would like to know how to get around using MTR in Hong Kong ? Hi Tommy, Thanks for the recommendations. went HK 3-5 Dec 2015. Tai Cheong Egg tart still best eaten hot and fresh! Mak (Ngaan) Wan tun Noodles – soup very strong shrimp flavour – delicious. Gave Yung Kee a miss, but tried Chan Kee Shen Zhen Roast Goose thigh (opposite Cordis@Hong Kong), standard is so-so, but the prices are steep HK$109 for one Roast Goose thigh. Will try to check out the rest next time if I go HK. Cheers! Hi David, great glad to hear that! Hope you enjoyed our post and plan for next food trip to Hong Kong! Hi Tommy, we just came back from Hong Kong n Macau on Jan 24 2016. We had used your attraction n food guide extensively. Thank you for compiling such a comprehensive list such that it proved very handy for my family who attempted our first free n easy trip. We tried a lot of HK food you recommended. My hubby especially loves the food. I sure will check your blog when we next plan our family trip. Xie xie! We’re planning a vacation to HK on june, some of the restaurants on your list definitely a must visit. I’ll be travelling with my kiddos so its just impossible to dine in,do they provide take away service? Thanks for this blog, helps a lot! Hi Erwin, yes most places provide take away services so not a problem for you in HK! I think they prefer customers to take away in HK, save space and faster turnover for them! Not to be mean, but TBH I think most these shops are overated. I think the standard in Hk has dropped over the past years. Most of the foods here are nice but not anything Wow. For example Australia Diary Co. Is basically just eggs, ham and macaroni soup. These are well better in foreign countries so there is no need to come all the way to HK and try it. However their egg white dessert is much better than Yee Shun Dairy. Basically what Im saying is use this guide as a general guide but dont expect to be amazed. Alot of these foods can be found everywhere else and could potentially taste better and be cheaper. Hi John, in some way you may be right but also like the australian dairy egg not everywhere has it, so to allow travelers a guide to try it instead not knowing what to eat is our main objective. For example fish & chip is available worldwide, but still ppl tends to eat in London. The places that Tommy suggested are reasonable on the price. Would appreciate if you can give suggestion of you know a better or cheaper place to eat for us the traveller as a guide. I think you made a mistake on the prices of Yat Lok. It was around 100HKD for the drumstick on noodle dish :/. Hi Tommy! Thanks for the great article – I’m visiting HK in a weeks’ time and will definitely take your list with! Out of interest, do most of the places (esp the smaller ones) take credit card, or do you have to pay in cash? We will be visiting Hong kong soon from Singapore. I love food and will for sure try out your list. Will you have any suggestion for an area to stay in. We love Food and Shopping but something not too commercial like Orchard Road. Hi, there are rarely street food in Hk, most are based in a shop or outlet. I am from Hong Kong and this is a pretty good list to cover in four days – well done! As you suggested, this is just to name a few, with a lot more waiting for food lovers to explore. Hi Jeffreyee, glad to hear that! Wishing you a wonderful trip there!